Wine and Cricket DO go together! Our long time love affair with and support for all things cricket was further developed this week with the announcement of our sponsorship of Falmouth Cricket Club for the 2012 season. The club enters four X1’s in the Cornwall leagues and is one of the oldest and most important clubs in the County. The 2nd X1 shirts have been emblazoned with the WIC logo and the beautiful Trescobeas ground now displays our shiny new advertising board. 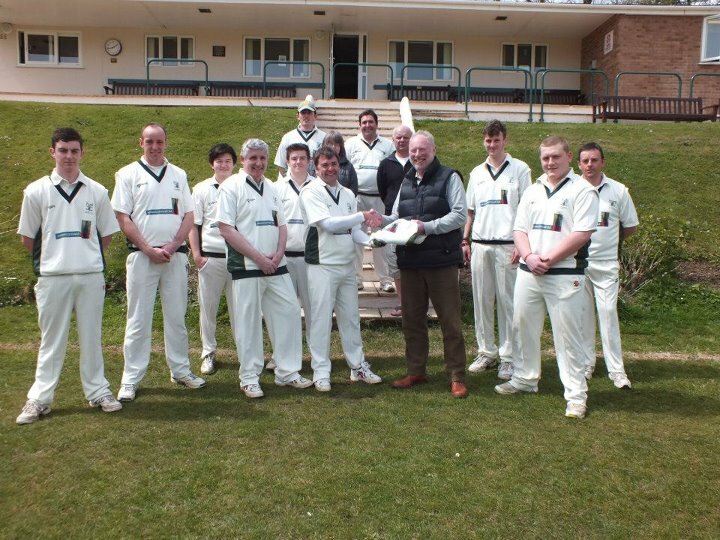 The picture shows Nigel presenting 2nd X1 Captain Scott Thompson with a shirt prior to the match against Paul on Saturday 5th May 2012. I had a splendid French themed evening last week at the Prince of Wales in Newtown St Martin. Chef Warren put together an interesting taster menu of regional French dishes like rillettes of pork with pickle pear and slow cooked paupiettes of beef. All the wines came from the Languedoc (our choice) and this gave us the opportunity to show off the diversity of wines available from this area. A succulent Rosé from Irene Tolleret’s Mas d’Auzieres in the Pic St Loup set off the rillettes very well. This was followed by the almost salty dry Domaine de Bertiers Sauvignon / Viognier from the coastal plain with monkfish and then the familiar La Forge Old Vine Carignan with the beef – all elderberry and Christmas spice. Star match of the evening was a Chardonnay Mousseux Brut from Domaine de Valensac which worked gloriously with a roquefort and walnut salad and finally a Muscat de Mireval from Chateau d'Exindre blended beautifully with a dreamy, aromatic mango bavaroise. Jolly well done all round and thanks to Tom and Anne for arranging it and feeding me so well! Independent Wine Merchant & wine shop based on the outskirts of Falmouth, Cornwall.